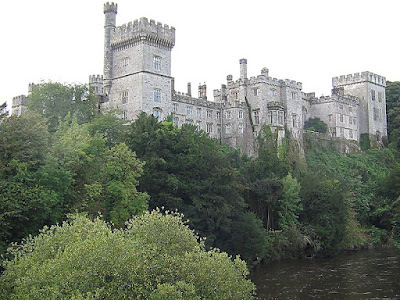 i finally got to go back to Lismore in co Waterford today! it's almost 3 years since i last visited the little town and i was sooo excited to get to go back during this trip. before lunch i had a nice sit by the fountain in the beautiful little park. here's a shot of the castle, it really is so gorgeous, it's the Irish residence of the Duke of Devonshire... lucky guy!!! anyway i bought a few cakes from the market and found a great little stall selling all sorts of super little bits of handmade jewellery. i spotted this great pair of earrings with quirky little closed umbrellas on them. i bought the bow yesterday from Topshop but wore it out today. the girl selling the jewellery was also making bits and bobs whilst running the stall, her name is Laura McNamara and she had some really great little pieces for sale. she also said she liked my dress which makes her even more super super and fabby. after Lismore i headed into Fermoy, another town i visited during my last trip to Ireland, only last time i was there all i did was fish in the river Blackwater off this bridge, but today i just stood and admired the scenery for a bit instead. i'm spending tomorrow in Cork city centre so expect a few more shopping bags to appear as i try to find space in my suitcase for all the new purchases!